Uther is a powerful support Hero that has access to high amounts of burst healing. Although his raw healing output is below that of Lucio or Malfurion (especially over time), he makes up for this with stuns and healing when it counts. As well as his ability to heal, Uther is regularly on the front line and for a healer, surprisingly hardy. You should regularly be hitting opposing players in the face with your hammer, and generally disrupting their play. Be aware that Uther has no "outs", so relies heavily on his stuns to secure kills and make a clean getaway. Devotion (Trait) - As a front line Support, there are going to be times where your death is inevitable. With Uther, it’s not as much of an issue, since he has 8 seconds post-mortem to heal his allies up thanks to Flash of Light. The trait allows him to make sure that the team fight can still be won even in his death. 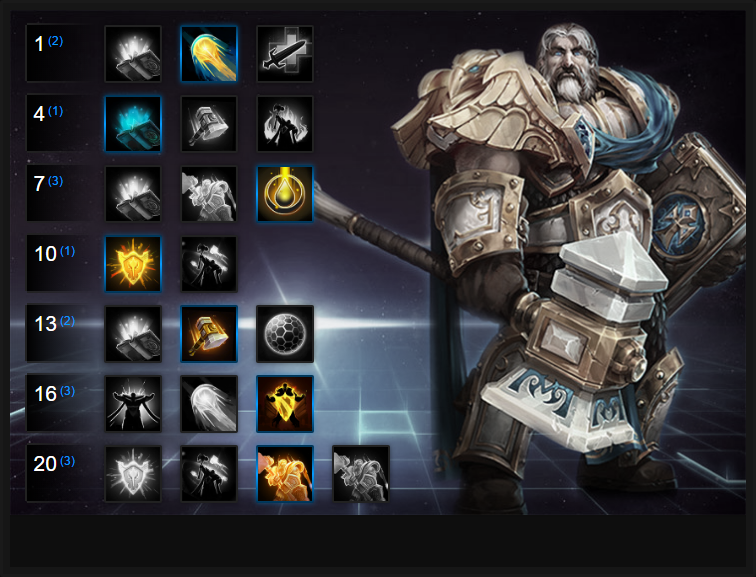 Best of all, as a passive component of Uther's trait anyone healed by him receives 25 armor for 2 seconds, reducing all the damage they take - from all sources - by 25%. Holy Light (Q) - Holy Light grants a massive amount of healing in a burst, easily turning one of your allies from “almost dead” to “ready to continue the fight.” Due to the high mana cost and cooldown, it’s generally correct to save Holy Light for when an ally has already lost a good chunk of their health; using this ability just to top someone off from some poke damage is sub-optimal. It's important that you choose the right target to heal with Holy Light because miss-judging it will see Uther have no burst heal for some time. Ideally, look for those on the front-line under immediate pressure. Holy Radiance (W) - Your AOE heal doesn’t restore as much health as Holy Light, but this ability can heal multiple allies, as well as offer damage simultaneously. I play fairly aggressive with Holy Radiance and key to playing Uther well is knowing when to poke the enemy with this, or to save it for your team. Ideally, you want to always position yourself so that you skim through allies with it (to keep their health topped up) while still hitting the opposition. The damage is more than enough to finish off low health heroes and if your team are in a group together, it's all you've got to heal them all at the same time. Hammer of Justice (E) - Hammer of Justice is part of what makes Uther valuable to his team outside of his heals. This can provide some decent poke in lane when you use it in between basic attacks, but really shines in team fights. The ability to lock down a squishy target for your team to kill, or stun anyone who’s attempting to take out your teammates, is extremely valuable. Just be sure to stun high value targets or to peel for a team mate who is under pressure. The cooldown on Hammer of Justice is fairly lengthy, so you can't afford to use it on the wrong player. Divine Shield (R) - If the opposing team tries to layer single-target crowd control, or if you have one teammate who absolutely needs to live during fights, Divine Shield will be your choice at level 10. Not only does it make the target completely immune to damage and crowd control, it also gives them a decent speed boost, helping to re-position (either offensively or defensively.) Used on Illidan diving deep or The Butcher when he triggers Furnace Blast, there's no stopping anyone with Divine Shield; even if it's for aggressive play. Divine Storm (R) - Deciding between Heroic abilities will often come doown to team compositions. If your team has a way of helping you get in the middle of the enemies, or if your opponents are dive heavy, Divine Storm might just be the way to go. The ability to stun all foes around you for 1.75 seconds can be absolutely devastating, and can win a team fight. Even outside of the ideal situation, just stunning a couple members of the opposing team can have a significant effect. With that said, you do need to get up close and personal with your opponents to get the most out of Divine Storm, so make sure you’ll have a way of reliably doing so when making your talent choice at level 10. Wave of Light is a must-have quest that allows Uther to increase the duration of Devotion from by 0.5 seconds. It's easy to complete as it simply requires you to deal damage or to heal 60 enemies/allies. It can be completed before level 10 and best of all, its passive allows Wave of Light to to refund mana and have its cooldown reduced. As Uther, you should regularly be in amongst the fight dealing melee damage. Holy Fire significantly improves this potential by causing AOE burning around Uther. Further attacks against players increase the damage by 20%, up to a maximum of 60%. Over time, during a fight, this can rapidly add up. If a member of your team is being focused, especially by ETC or Arthas, Cleanse is an amazing skill to free them up so that they can freely run away without fear of being CC'd again. In most cases, it's absolutely a must-have. Variable: Guardian of the Ancients is surprisingly strong, especially in the current meta versus two warriors. Cleanse often isn't enough to help your entire team, especially with multiple instances of crowd control being used so Guardian of the Ancients is a good choice. It boosts the armor from your healing from 25 to 50 and affects all those who are healed when stunned, rooted or silenced. It might not free up the movement of a hero, but it massively reduces the damage they take. Against most dive and melee heavy compositions, Divine Storm is incredible. The AOE stun can shut down the opposition in an instant, and it also means you can follow up with a Hammer of Justice against 1 target afterwards (even better with Benediction). Used on Heroes such as Malthael, Anub'arak or Greymane, it's incredible. Variable: If you've a high value target on your team, such as Malthael, Divine Shield is often worth taking, as you can use it on them to ensure they're free to deal massive damage without interruption. Allowing Uther to slow and reduce the damage of an enemy who is stunned by your Hammer of Justice, Well Met is amazing for shutting down one specific hero. Whether they're attacking a high value ally, or someone you simply need to lock-down, it's a brilliant talent in any team fight. Activating Benediction allows your next ability to have its cooldown reduced by 10 seconds and the mana cost reduced by 50. It effectively grants you a double Hammer of Justice (Benediction > Hammer of Justice > Hammer of Justice). Alternatively, it also allows for a group burst of healing (Benedition > Holy Radiance > Holy Radiance) or a burst of instant, single target healing across multiple allies (using Holy Light instead) This is amazing in any team fight. When you die as Uther you remain in game as a spirit capable of healing allies. With Redemption you'll re-appear after a period of time. It gives you a second life if you're unfortunate enough to die. Variable: If you aren't dying much (honestly, you shouldn't be as Uther) take Divine Protection. It allows you to stack the armor component of your trait, ensuring a double-heal (which pairs with Benediction) offers 50 armor to all those affected (amazing with a double-holy Radiance). These Hero Threat Levels (1 being lowest threat and 10 being highest threat) are to help you determine which enemy Heroes can give you a headache. For the Heroes listed here, take extra care as they're particularly dangerous for Uther. Kerrigan: Staying out of her range is important because if she catches you with Primal Grasp > Impaling Blades you're going to take a huge amount of damage. Although you can stun her, you'll be out of position. Lunara: Uther has fairly lengthy cooldowns on his healing so having Lunara constantly spread poison, while dealing high basic damage, stretches his mana pool to the limit. Nazeebo: He's actually a good counter to Uther because his Zombie Wall can stop you escaping but also prevent you reaching the enemy to stun them. Your attack speed is also so low it takes a while to get out the wall. Nova: Nova loves to kill Uther. If you are not full health and you are alone, you are in jeopardy. Try to always stay near allies and keep Hammer of Justice ready when she appears. The Butcher: His charge, Lamb to the Slaughter or self heal can rip you up in seconds. Even if you stun him, a good Butcher will have saved his Lamb to the Slaughter to ensure he can finish you off. Keep your distance and have Divine Shield ready! Thrall: His root, Chain Lightning and Sundering can cause real issues. Even if you do stun him, if he uses Windfury he will quickly catch you up. Valla: Her range combined with damage and a powerful stun elite can hold you down and prevent you from getting near her in order to deal damage or stun lock her in place. Zeratul: He is much like Nova, only he kills you quicker. Be nervous if he's in the enemy team as he's still capable of taking your health down very quickly. Stun him as soon as you're able. This list of tips and tricks are just a handful of things we think will help your Uther play. We'll continue to add to the list as required and if you have any tips you'd like to share, let us know in the comments below and we'll place them here. 1. Your trait allows you to grant anyone you heal 25 armor. That's a 25% damage reduction. With that in mind, try to always have the buff active on an ally who is under immediate pressure. 2. Your trait allows you to heal allies when you've died for 8 seconds. If you can, try to die in a team fight so you can maximize your healing output (which is significant when dead). 3. Remember that Holy Light is your single target burst heal, which also - when you've healed - grants 25 armor and heals you at the same time. 4. Holy Radiance is your AOE group heal and it heals in a single line telegraph. It fires quickly so be sure to tag as many of your team as possible. 5. If you can, it's often worth saving Holy Radiance as a secondary heal for someone under a lot of pressure. Holy Light > Holy Radiance is around 600 instant healing. 6. Don't be afraid to poke the enemy team with Holy Radiance. Your quest talent reduces its cooldown slightly while it also deals a fair amount of damage. 7. Using Hammer of Justice > Holy Light and Holy Radiance against a target is a large burst (dealing around 500 damage). 8. Hammer of Justice can be used on minions. Try not to use it on them by mistake when trying to stun someone in lane. 9. Hammer of Justice is as much about protecting an ally as it is securing a kill. See an ally under pressure? Peel for them by stunning their opponent. 10. Divine Shield should always be saved for yourself (if you've been pulled out of position) or an ally about to be killed. Try to save high value targets. 11. When using Benediction, judge what you need. Do you need a double stun? A double burst heal or double AOE heal? Prime it accordingly.